Please bring your insurance card, a government issued photo ID, and your physician’s referral or prescription for physical therapy if you have one. 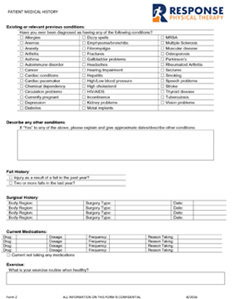 We also recommend that you bring any records from your previous doctor, a list of your medications, medical history and a list of any questions or concerns you may have. Please make sure that you arrive at least 15 minutes before your scheduled appointment to fill out the necessary paperwork and insurance information. We recommend that you bring comfortable, nonrestrictive clothing or athletic wear to your appointment. Your clothes should also allow us to evaluate your area of injury, so please dress accordingly. If you have any questions, please contact us prior to your first appointment. We expect the initial visit to take about 60 minutes. Follow-up appointments are usually about 45 minutes, but this may vary depending on your condition. If you have a specific time constraint, please let us know before your appointment and we will do our best to accommodate you. 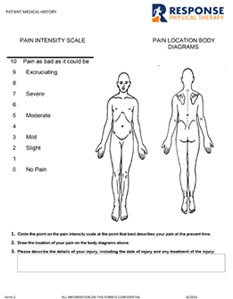 Your physical therapist will estimate on your first visit the frequency and duration of visits that you will need. This is based primarily on your goals, the level of function you want to achieve, the severity of your condition, precautions, post-operative protocols, and any other complicating factors. Your physical therapist will typically re-evaluate your progress after 30 days and will let you know how close you are to reaching your goals. Most insurance companies pay for physical therapy. Some companies only offer limited coverage. 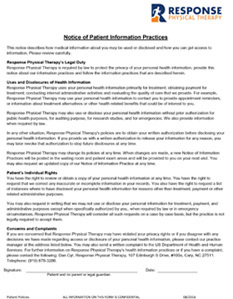 We recommend that you call the benefit number listed on your insurance card to check your insurance benefits before you start physical therapy. As a courtesy, we will verify your benefits when you give us your insurance information. Most insurance companies pay for physical therapy services that are provided by a licensed physical therapist without a physician’s referral. 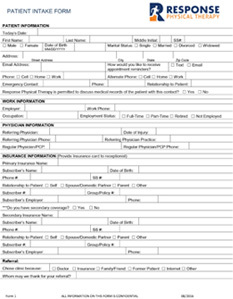 We would be glad to help you through this process and make the appropriate referral if your insurance requires a physician’s prescription. Please call us if you have questions, need assistance, or would like a referral to get a diagnosis from a doctor. We accept most insurances; BCBS, United Healthcare, Aetna, Cigna, Medicare, Tricare and Workers’ Compensation. Services may be covered in full or in part by your health insurance or employee benefit plan. 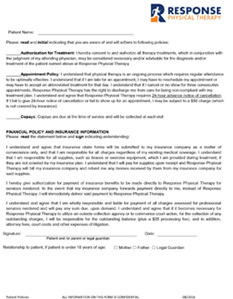 If you would like, we can verify your physical therapy benefits as a courtesy for you. Just give us a call with your insurance information. If you don’t have insurance or choose not to use it, you can still see us. We offer a flat-rate self-pay option, which is discounted off our standard fee schedule. Please call to inquire. If you fail to give a 24 hour notice of cancellation or fail to show up for an appointment you may be subject to a $50 charge (which is not covered by your insurance).